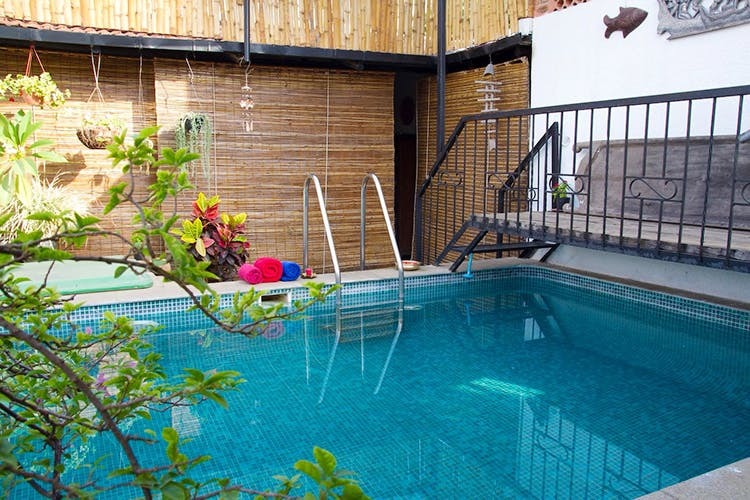 On a quiet cul-de-sac off Cunningham Road, this Airbnb comes with old Bangalore charm, a private pool and an unmatched location. We’re very fond of staycations. They give you those holiday feels, without the drama of travel. So naturally, we went scouting on Airbnb to find places we could escape to in Bangalore. Called “Enjoy the comforts of a home.Room2” or “Enjoy the comforts of a home.Room1”, you get to live in a heritage bungalow, just off Cunningham Road. If you know Bangalore well, then it’s the same quaint property that the restaurant Secret Garden was housed in once upon a time. Filled with potted plants, lovely trellises, a garden space, a terrace swimming pool (though not too large), and antique furniture, it’s easy to call this place home!The rooms are tastefully done up with antique furniture, and classic decor in the form of crystal, Tanjore paintings, gorgeous carpets and even some stunning metal statues and centrepieces. It’s like a treasure trove and you get to live in it! The two rooms are done up similarly, with four-poster beds, old almirahs and writing desks to continue the elegance of the home. We particularly love the balcony and terrace areas which is a slice of heaven for Bangaloreans and visitors alike. Overlooking the plush gardens, it is done up with wooden reclines, plants, and perfect to unwind with a good coffee. The little pool on the terrace might be our favourite spot to just lounge around and unwind. The space is dotted with wrought iron furniture taking you back to the Bangalore of the old! Yes, yes, there’s no pollution around here, and traffic seems like it doesn’t exist! You see why we like stay-cationing here!